As a novice huntress, most things hunting are new to me. I’m generally a curious person and want to understand why things are done certain ways. Additionally, since I don’t like surprises, I generally ask tons of questions so that I am prepared. On our recent African trip, it never occurred to me to consider the memorialization of the harvested animal (I was probably too focused, while preparing for the trip, on getting the actual animal and not about what happens after I got it!). It’s a very important aspect of the hunt. As a huntress who took her first animal, and as a visual person, the photograph taken will always bring back the excitement and memories of that day. (The mounted trophy, when it is placed in the soon-to-be-trophy room, will also be a reminder!) Additionally, there’s an etiquette in how the harvested animal is photographed! 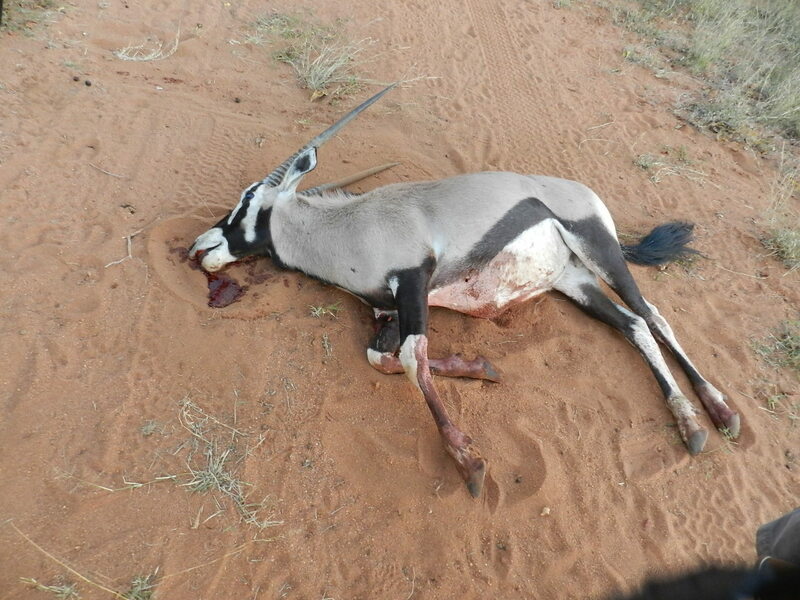 With the gemsbok I took on my first day, because of where the first shot struck the animal, by the time we reached where it fell, there was quite a bit of blood. Hunters understand that there is blood involved in hunting, but when showing off my first trophy photo, I had to consider that I would be showing it to non hunters or those more sensitive to blood than I. I know a few that would object to seeing the photo above! Therefore, cleaning up the blood on the animal, or positioning the animal so that one doesn’t see the blood is preferred. Cleaning up the surrounding area so as not to obstruct or detract from the viewing of the animal is also important, especially if the animal drops in thick brush or in deep water! Making sure the bakkie and other non-native items are not in the photo is also advised! When I show my photo of my trophy animal, I want to make it appear that I was out in the middle of nowhere, far, far away from civilization! The photo should emphasize the animal, and not on the cell tower or suped-up bakkie! Tucking the legs and positioning the head so that the animal is sitting in as normal position as possible will make the trophy photograph look normal and live. 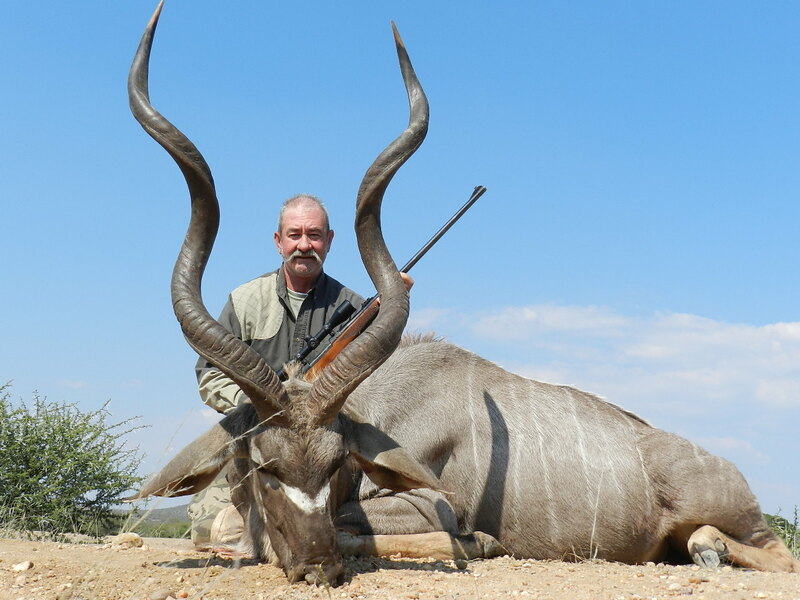 With my first gemsbok, and the impala, the trackers moved the animal so that it was away from any brush, and they tucked in the legs and propped the head. 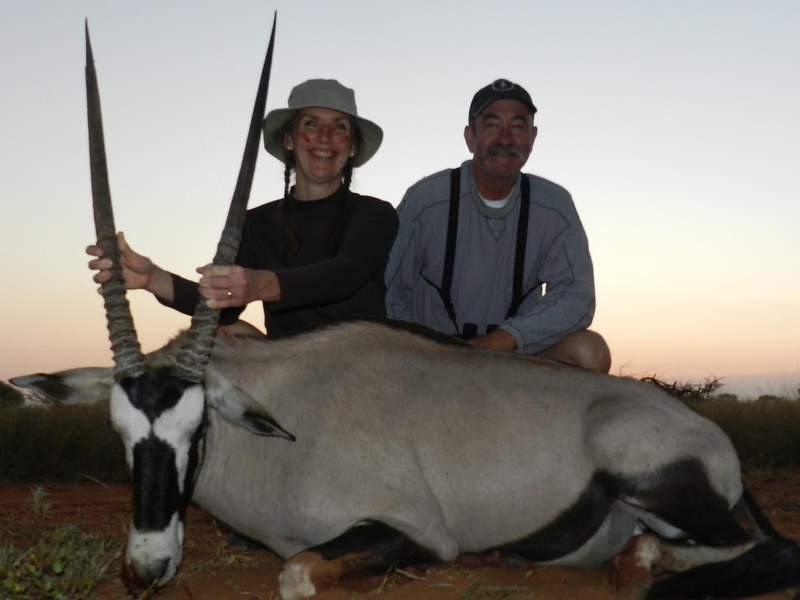 With the gemsbok, we had a hard time keeping the head up, so I had to hold it up by the horns in the photos. In hindsight, we probably should have made a mound of dirt under the head to help prop it up. Also make sure to include the whole body of the animal. If you are going to memorialize the animal with a photograph, include the entire animal and not just the head and horn! A good way to show off the antlers/horns is to use the sky as a backdrop. Take the photo from the ground to get this perspective, unless the animal is placed on a natural ledge of course! 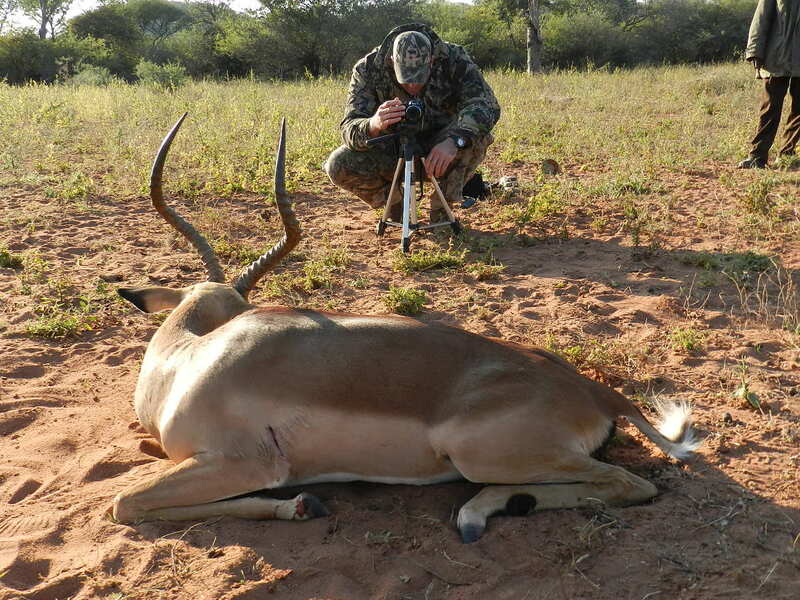 Include the rifle or bow used to harvest the animal. Make sure it’s unloaded and not pointed at anyone! If wearing hats, and removing the hat would disclose hat hair, make sure that your face is visible and not shadowed. Include the PH and tracker in your photos. They worked very hard to get you your trophy and should be recognized for it by being memorialized in your photo. Our tracker, Evans, was so proud to be included in my first animal’s photo, he repositioned his cap to look cool! The photograph should represent the wonderful experience you’ve just had!